I think flop bet is fine with JJ and maybe QQ. I'd check AA and KK. I also prefer betting JJ QQ instead of KK+. Not sure about the sizing, but i think betting bigger is better, bc his calling range will almost stay the same no matter if u bet 1/3, 1/2 or 2/3. Against his raising range i have no clue atm (sitting here somewhere in a shop). If we get raised, we are probably facing a polorized range of sets, T9 and as „bluffs“ very strong combodraws. Idk how we perform against this range. „We“ can check later the equities. Do u think that (good) villains will bluff wider in this spot with random hands (they actually shouldnt have that much random hands, bc mp call3b range should be pretty tight), so that they also a have bet/fold range? Bc this flop hits there range so mich better. Turn i dont like the check bc i dont want to give free cards with the opportunity of xback, so he can realize his equity. Also his range on the turn shouldnt be that strong after only calling the 1/3 bet on the flop. I assume he will raise all his nutty hands on the flop. So i think we always have the best hand on the turn and therefore we want to bet BIG on this monster drawheavy turn. Bc this flop hits there range so mich better. Can someone please explain this to me or correct me if what I am about to lay out is wrong, because I see people say this a lot on middling boards: "that it hits the caller so much harder or better." I think in a lot of cases it does, but I don't see it here. I know chief plays a 3b or fold strat from SB here, so he is 3betting a linear range here, with 2.5x open it will be slightly wider. So, IMO, this is a board where SB(Hero) has some slight range advantage due to having more overpairs and possibly slightly more flush draws and the nut advantage is pretty even. Based on ranges I have, the equities are 52.9% for SB(Hero) and 47.1% for MP. I know we are OOP so it will be harder to realize, but just not seeing how this is a board that crushes the 3bet caller so much more than the 3better. I know this has nothing to do with the hand. I agree, that MP is probably raising most of his strong hands and combo draws on the flop, so I feel pretty good on turn and I would prob just bet my normal 22bb. I guess I would just be concerned about what to do on river. I think MP can have pretty much all flushdraws and back door flushdraws, as most of them are going to be nut flush draws or some sort of a combo draw. So there are not going to be very many good cards for us on the river and even on a blank, can we jam for value? On cards that complete the draws or overcards we can just x/f. For this reason, maybe chiefs x/j on turn is better, if we think that MP is going to bet often on turn when checked too. I would be concerned it would get checked back too often and IP can realize all their equity for free. 1) Why HERO isn't betting KK-AA on the flop? Of course JJ-QQ need more protection, but those hands are still value-bets, especially given that it's not a single-raised, but rather a 3bet pot (so smaller SPR) and with not as wide ranges as compared with like SBvBU spot. What's the reasoning behind checking and what's the plan for the hand? 2) If HERO isn't betting some portion of his range (or does he? My first question is about it) that means that on the flop he's not betting his entire range and in that case wouldn't it make more sense to be betting a more polarized range and therefore use bigger sizing??? Hopefully you guys could clear it up, as always thank you very much for responses! I dont think this is a board that SB cbets a lot. Possible that solver prefers a bigger sizing than 1/3 on the flop, I didnt put too much work into that. 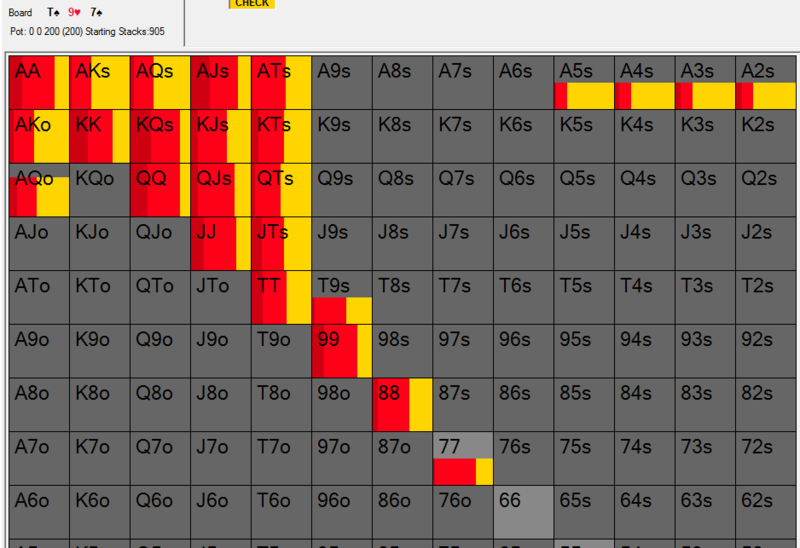 Reason for checking AA/KK is that you cant bet bet jam on the majority of runouts, QQ/JJ still has protection to get. Reason for check/jamming turn is that I expect MP to bet too many draws. Ye sorry, somehow i thought hero is sitting in the bb, so that we dont have all the sets. If u expect villain to stab a lot or often on the turn, then x/jam should be good or even the best line? The X'th time re-reading the whole thing and i stumbled on this - i actually don't think that it's that bad to go for the turn check. c) if villain does indeed check the turn back and river is a card that completes draws, we can just x/f (as there's way less bluffs likely then, prob -EV bluffcatch) and we would save our potential 22BB turn bet. The only drawback i could see is that we don't get value from drawing hands, but those can actually stab vs our check (we x/j), o jam the turn vs our bet (which isn't too good for us either), so i don't think the effect here is too significant. Would love to hear more feedback on what you guys think, thank you for responses! I thought that we are pretty much always range-betting the flop for small size. This puts two questions in my head:1) Why HERO isn't betting KK-AA on the flop? 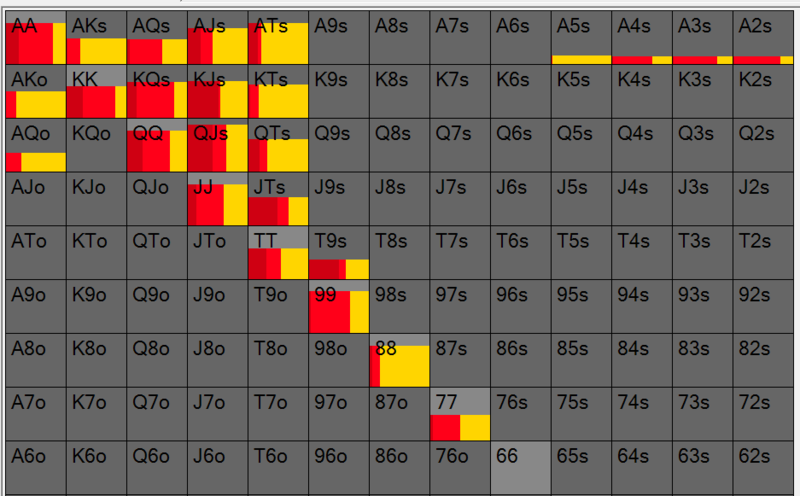 Of course JJ-QQ need more protection, but those hands are still value-bets, especially given that it's not a single-raised, but rather a 3bet pot (so smaller SPR) and with not as wide ranges as compared with like SBvBU spot. What's the reasoning behind checking and what's the plan for the hand? This is a board where I am unsure and will check with solver after doing this text. This board does not seem particularly good for "bet everything 1/3" to me. It seems like a board where MP hits quite hard, and equities should become close comparing to pre flop (even if SB still has all sets). So just by this simple calc we can already guess this is not a board where SB is betting 75%+, even for 1/3. Actually, if i had to choose between bet 100% or check 100% it might make more sense to check 100%. So, that also probably means that SB will prefer a more polar betting with bigger size. I could be wrong. 1) because we are checking a decent amount on this board and a hand like AA is a very good slowplay because it lets villain hit top pair on the turn and does not need as much protection. Plan will be to XC flop mostly and then XC or XR turn. If flop goes check check it might be a nice move to go for XR turn on most cards. 2) probably yes, answered in the previous text. Let's take a look at solver. So this is not helpfull at all, SB just mixes all three options, but prefers the smaller sizing (40% checks). SB also skip XR 20%, no idea what does that mean, i guess it is to prevent MP from stabbing the whole range without worries. MP vs small bet plays in a very expected way, with the surprise being very few raises, only 5%. One thing that I already knew but might be good to point out is that MP checks back on the turn a lot of good draws, because those hands really hate to get check jammed and that's what SB should do if MP does bet them. In practice this solver exercise is not particularly useful, I guess if we start playing with nodelock we might find some interesting stuff. - Explloitatively check jam on the turn might be amazing if we think MP will stab most draws.